The Masquerade is a catwalk competition with prizes awarded according to a judging criteria outlined below. This competition is for ALL costumes, handmade, bought or altered. There will be no pre-registration for this competition, please sign up at the Cosplay City Championship desk on the day of the event. The competition is open to all ages but all entrants under 12 MUST have their form signed by a parent or guardian. Please bring proof of age. If you fail to produce proof of age when asked, you may not be permitted to enter the competition. Cosplayers can enter as individuals or groups. If you wish to go on stage as a group please make sure that members of your group hand in your entry forms at the same time so that they can be kept together. Costumes may be purchased or hand-made. Costumes are permitted from any form of popular media. This includes, but is not limited to, comic books, films and television, video games, anime and manga and tabletop gaming. Costumes are expected to conform to a certain level of decency as this is a family event. Costumes considered inappropriate will not be allowed to enter the Masquerade. If you are unsure if your costume is suitable, please email cosplaycitychampionship@gmail.com to discuss. Judging will be performed by a panel of up to 3 judges, including costumers and industry members. 5 points for accuracy and likeness – similarity to reference picture provided, therefore it is in your best interest to provide a good reference image. The judges will also look at how you have used makeup and wig-craft to create as good a likeness as possible. 5 points for craftsmanship – This will consider the overall complexity of the costume and any props as well as its neatness. Points will also be given for good use of makeup and hair. Any unusual materials or techniques will be rewarded with extra points. Judges will use these points as a guideline when making their final decision. Points will not be revealed to anyone outside of the judging and organising panel, including the contestant in question. You may provide a reference picture if you wish. It can be handed in on the morning of the competition as a printed A4 document, labelled with your name and the name of the character. You may provide up to 2 sides of A4 containing your reference pictures. The larger and higher resolution, the easier it will be to judge. Pre Judging Pre-judging will not occur for the Masquerade. There will prizes for 1st and 2nd. There will also be a kids prize if there are enough entries on the day. Judges decisions are final and discussion of them will not be entered in to with any contestant or member of the public.Prizes will be awarded after the masquerade at the closing ceremony. If the winners are not present, their prize will be held for them till they can collect it, or if need be, it can be posted to them. 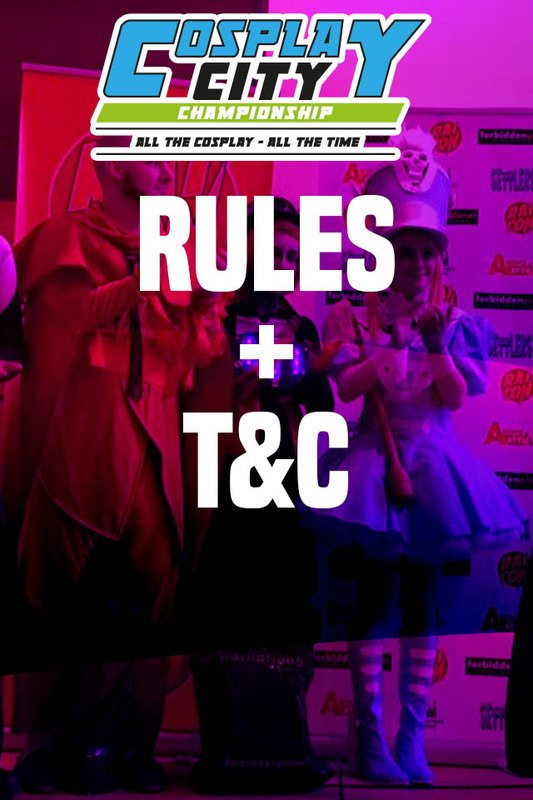 Prizes cannot be collected by another individual on the winners behalf unless signed permission is given at the cosplay desk. You may be filmed or photographed during the Masquerade and Attic Events (Cosplay City Championship) or its associates may wish to use your image. By entering the competition you are agreeing to your image being used by Attic Events (Cosplay City Championship) and affiliates for advertising and promotional purposes and any other reasonable purpose. 6. Cosplay City Championship accepts no liability for any loss, damage, costs, expenses or claims suffered or incurred by any person as a consequence of any use of or inability to use this application process, the event website, or any related media content. It is the sole responsibility of the applicant and/or parents/guardian to confirm with Cosplay City Championship regarding any queries or questions they may have about application, selection and/or participation.